By crying, we can spread the message of Imam Hussain (AS). The concept of Azadari, of mourning for our Imam (AS) was started by his family. Through Azadari, Imam Hussain (AS) was able to save Islam, and by mourning and crying for the Imam, we are able to keep his message alive in our heart. Every year when we attend Majalis, we feel the pain of Imam Hussain (AS) and his companions, and we feel the pain of his stand against injustice, against “the bad people.” By attending Majalis and feeling this pain, we are reminded of our duty to stand with Imam Hussain (AS) against evil. Although we cannot go to Imam Hussain (AS) directly, we can use his message in our lives by standing up and helping wherever we can. Color and cut out tear drops. For younger kids, we wrote one thing that we knew about Imam Hussain (AS) and his family. For older kids, you can write a way that we can help and support the Imam (AS), a way that we can spread the message of Islam and stand up against injustice. For example, volunteering in the majalis, donating blood, helping the people around us, protest against the wrongs happening in this world, etc. Assemble the tear drops as if they are falling like rain from our eyes. We tied them to a hanger with yarn. 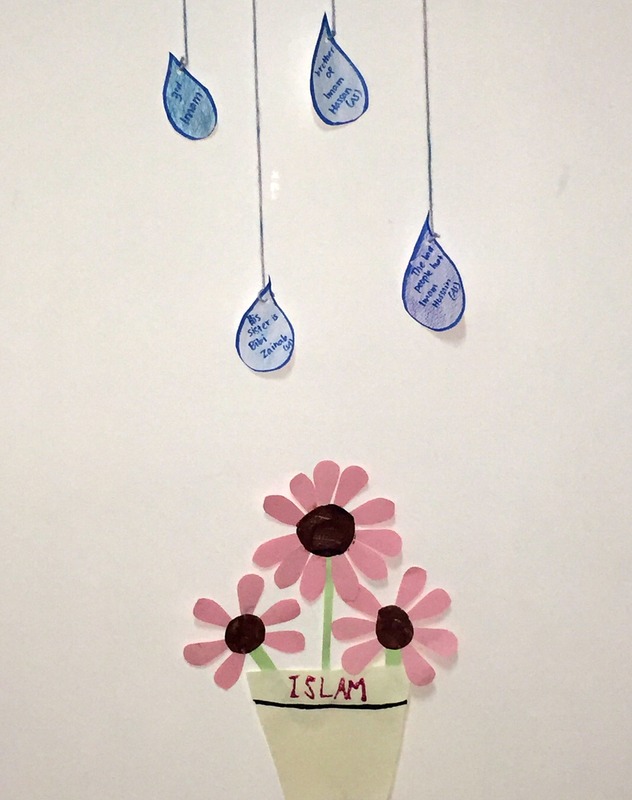 Below the tear drops, make flowers, and label them “Islam,” illustrating how our tears help Islam grow.